Here at That Fish Place – That Pet Place we are doing our best to educate our customers on the dangers and risks of using goldfish as bait. In addition to offering an extreme risk to native species, anglers also face steep fines if they are caught in possession of goldfish for bait. In Lancaster County Pennsylvania, where we are located, there are several bait and tackle shops that offer better alternatives for fishing. Goldfish are freshwater members of the carp and minnow family. While many of us admire them from the view of our tank, they are actually one of the first aquatic invasive species to reach North America. How did the goldfish go from being the cute googly eyed fish you would feed after school, to being such a widespread risk to native plants and species? Goldfish began to come to the America’s in the 1600s as ornamental fish for aquariums and water gardens. If the fish became too large for their surroundings, or the owner became tired of it, they simply got rid of it in the closest freshwater source. Today, goldfish are becoming reintroduced as livebait. Pennsylvania has stepped in, as well as many other states to make it illegal to use goldfish as live bait. Goldfish will typically eat their own eggs when held in captivity, so breeding is not a large issue for most hobbyists unless they are intentionally breeding their goldfish. Given the right conditions, goldfish can spawn several times a season. A lot of the eggs will get eaten by the adult goldfish once they are laid, but several hundred eggs are produced at each spawning. With only a few eggs eaten, and fry hatching within 48-72 hours, you can imagine how just a few goldfish can turn into a large problem rather quickly. Often referred to as the “little piggies” of the aquarium, goldfish are opportunistic feeders and will not stop eating of their own accord. While goldfish typically feed off of crustaceans, insects, and various plant matter; when this food is scarce they will eat eggs from native species nests. The native egg-laying species populations have now been disrupted, and due to that, the population has declined and disrupted other wildlife food chains. 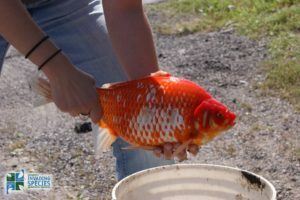 It is unlawful to use or possess goldfish, comets, koi and common carp as bait fish while fishing in the state of Pennsylvania. If you are caught fishing with feeder goldfish or any other illegal bait fish there is a minimum $120.50 fine, and you can be fined an additional $20.00 – $50.00 per illegal bait fish. Pennsylvania Fish & Boat Commission wants you to know that you aren’t off scot-free just yet. Law enforcement also has the authority to confiscate or seize, any fishing equipment as evidence of your violation of the law. 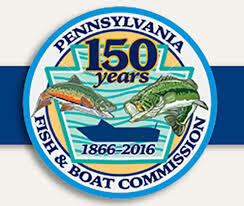 The Pennsylvania Fish & Boat Commission may, upon proper notice, suspend or revoke your fishing privileges, boating privileges or other permits of any person convicted (or acknowledging guilt) of a violation of the Fish and Boat Code or Fish & Boat Commission regulations. That would also include your naive fishing buddy. Should multiple violations occur within a 12-month period you will be given a fine of $200 in addition to the previously mentioned summary offenses. That $0.10 feeder fish now cost you a fishing license, a fishing rod, fishing equipment, a whole lot of cash, a boat, and a fishing buddy. The consequences per state will vary, so check with your local Fish & Boat Commission for more information. The employees at That Fish Place – That Pet Place are all avid hobbyists, and a lot of us live in the local river towns where fishing is just a way of life. We don’t want to ruin the sport for other enthusiasts, just as much as we don’t want others to ruin the sport for us. We will always strive to do our best when it comes to conservation efforts, and want to encourage others to do the same. Thank you for reading! With the wide range of body shapes and colors, it is hard to believe that all of the fish we call “goldfish” come from the same ancestor, a rather dull, silver/brown carp known as Carassius auratus. Almost two thousand years ago, Asian fisherman raised these fish in ponds for food, and soon the natural orange and yellow mutations of these fish caught the eye of Chinese royalty. Over time, the fish that we know as “goldfish” were selectively bred for specific traits and colors which would eventually become the varieties we see in fish stores today. Let me introduce you to some of the most popular “breeds” that have become aquarium mainstays over the past few hundred years. Eileen here. Some myths and legends are universal. Almost every country has some version of a “bigfoot” legend. Nessie is one of Scotland’s biggest celebrities. People are abducted by aliens and UFO’s are spotted in the sky around the world. What does the aquarium hobby contribute to this list? Like most of those other stories, this one likely started because people saw some truth behind it. They saw their fish grow large in relation to their aquarium, stop growing, then die. But, just like we now know that the Earth is not flat and we will not fall off the edge of it if we sail too far, we now know that the size of an aquarium does not dictate the size of a healthy adult fish. The most common victim of this theory is the comet goldfish, the fish often sold as very inexpensive feeder fish or won in carnival ping-pong ball toss games. People win the fish or buy them as inexpensive pets, not knowing that the tiny fish they took home should be able to become an 8-10 inch adult with a lifespan of 10 years or more if well cared for. “Goldfish bowls” are sold almost everywhere that carries fish supplies. Small aquariums – 10 gallons or under – are often sold with pictures of small fancy goldfish on the box so it is no wonder that people may be unaware of the problems they are walking into. Keeping any animal, fish or otherwise, in a habitat that is too small for it causes a number of problems that might not be obvious at first. The fish people win at carnivals or purchase as small juveniles might be fine for a short time in a small aquarium, but as the fish grows, so does its requirements. Looking at the same situation in terms of a person instead of a fish, it becomes more obvious. An infant, for example, doesn’t require much space for his needs to be met. He can feed and exercise within the area of his nursery and regular cleanings can keep his nursery healthy. But, as the infant grows into a toddler, his needs also grow. He requires more space to exercise so his muscles develop properly. He is growing and needs more food and so produces more waste as a result that the same regular cleanings the infant received cannot control. As he grows through his life, that boy can certainly grow into a man if never let out of the nursery that he was kept in as an infant, but that man will not be as healthy as he could be. His hygiene and development will have suffered from being kept in a confined space and not allowed to flourish and develop properly and he will probably not live as long as a man whose environment has been allowed to grow with him. The same happens when a fish is kept in a small tank. As the body of the fish grows, so does the amount of waste it produces and the food it needs. This can affect the water quality of the aquarium and lead to disease caused by high ammonia levels, high nitrite levels, low dissolved oxygen content, low pH and other incorrect parameters. Just as a person kept in a small space cannot grow properly, the fish would also physically not be able to grow to its full size. Its body and skeletal structure may be stunted by the lack of space and ability to exercise and swim as it should, but the internal organs often continue to grow at a normal rate. The internal damage this causes, in combination with water quality issues, will lead to a premature death. While a small tank can certainly affect the size of the fish, it is not the way that we once believed. There is no internal sensor in a fish that can detect the size of its environment and adjust its growth accordingly. The fish we keep are just as dependent upon us as small children to give them the proper care needed to keep them healthy so it is up to us to be aware of what their needs are and to do our best to make sure those needs are met throughout the fish’s life. It is the time of year when carnivals and fairs pop up across the land, with games and rides and fun for all (well the kids anyway). What that brings to mind here at TFP are all the unsuspecting parents who have suddenly become the proud new owners of a pet fish that their kids have won as prizes in these games, and need to know how to take care of them. Every year we sell thousands of fish to carnivals as game prizes, and then find many people who need help with their new “prizes” after they get them home. We’d like to take some time to review the most common fish found at your local carnival or fair. The practice of keeping goldfish (Carassius auratus) dates back to as early as 970A.D. when domesticated fish keeping began in ancient China. Farmers would impound carp as food fish, these carp where silver grey fish, like the wild carp found today. A genetic mutation in some of the carp gave them a yellowish gold color. The farmers would then selectively breed these colored carp, over time this selective breeding lead to what we now know as the modern goldfish. As the popularity of these fish grew, and they spread out from China, selective breeding of various mutations in the species has given rise to many different types of goldfish over the centuries. These different types of goldfish include the Oranda, Ryukin, Shubunkin, Comet, Lion head, Bubble eye and more. Goldfish are seen as good luck symbols in many oriental cultures and some breeds even have religious roots; the Celestial Eye goldfish were bred because monks believed their eyes looked towards the heavens. 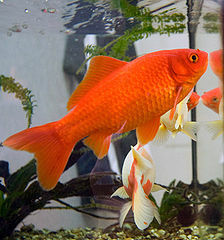 Goldfish are peaceful fish that do well with other breeds of goldfish or other cold water fish. There are little to no issues with aggression, aside from the odd individual or “nippier” variety. It is not recommended to mix goldfish with tropical fish (tetras, guppies, etc) due to differences in water quality and temperature preferences. Goldfish prefer aquarium water temperatures from 60 – 74 degrees. Goldfish are commonly kept in outdoor ponds that will reach freezing temperatures in winter, provided it can not freeze solid, and a floating heater is used to insure constant gas exchange. Goldfish will tolerate a wide range of pH values, from 6.0 to 8.0, so long as conditions are stable. Goldfish are easy to feed as the will accept virtually any types of fish food. Flakes or pellet formulas especially for goldfish are best. Avoid meaty foods, goldfish have a high vegetable requirement. Vegetable matter like algae sheets, cucumbers, or peas can be supplemented into the goldfish’s diet to help maintain optimal health. Goldfish tend to be messy fish, with a big appetite, which leads to large amounts of waste. As a result monitoring goldfish’s water conditions is very important. It is not recommended to keep goldfish in unfiltered bowls, although it is possible if frequent (usually bi-weekly) water changes are consistently done and the water remains aerated. Live plants can be used, although they will usually end up eaten as the fish get bigger. The best environment for goldfish is an under stocked aquarium with ample filtration and regular maintenance. The Betta fish, Betta splendens, is another commonly found “prize fish” that you may have the pleasure of become the new owners of. Bettas are one of the most beautiful freshwater fishes that are available in the aquarium hobby; their striking color and ornate finnage are quite remarkable. Bettas are often chosen as prizes because of their ease of care, and ability to do well in very small amounts of water. The Betta is native to areas of Thailand, where they are exposed to times extreme rainfall and drought, which during times of drought can result in little more than a puddle to live in. Unlike most fish, the Betta does not solely rely on oxygen from the water it resides in, it has the ability to breathe air. Bettas are members of a group of fishes called Labyrinth fishes. Labyrinth fishes have a specialized breathing organ, called the labyrinth, which allows them to breathe air at the waters surface, somewhat like a primitive lung. The ability to breathe air allows the Betta to survive in very warm water with little or no dissolved oxygen. This is how Bettas are able to cope with very small fish bowls, and is often how they are displayed and sold. PLEASE do not use this as an excuse to keep a Betta in extremely small environments for extended periods: although they can survive in only a few ounces of water, they will not be happy and comfortable. Bettas can be kept in unfiltered bowls, provided adequate water changes are maintained (at least 20% per week), and water quality is monitored. 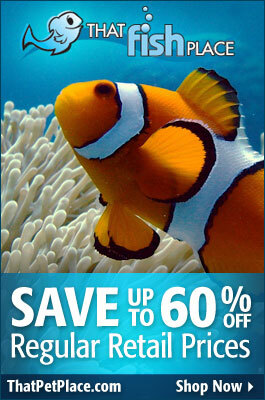 Larger aquariums of at least several gallons are preferred, the bigger the better. There are a number of small desktop aquariums that are ideal for Betta keeping. 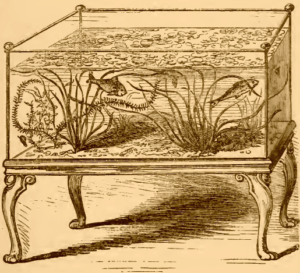 There is another side of the Betta fishes heritage that there is much controversy surrounding. Another common name for the Betta, is the fighting fish, or Siamese fighting fish. This name comes from the aggressive nature that these fish have towards one another, especially two males. The Thai name for these fish is”pla-kat”, which means biting and tearing fish. When placed in the same tank, two male Betta fish will literally fight to the death. There is a whole world of fighting and gambling involving the Betta in other cultures. Fighting Bettas is not considered an appropriate practice in the hobby. There are many commercially produced Betta foods, in pellet, flake and freeze dried forms. A good varied diet is best. Feed only as much as the fish will eat in a few minutes, take extra care not to overfeed, especially in unfiltered bowls. Bettas prefer warm water, 72-78 degrees, so avoid cool areas like window sills, and hallways when possible. Direct sunlight should also be avoided; this will lead to unwanted algae growth, and temperature fluctuations during the day. While you can not keep bettas together, they can be kept in peaceful community tanks, with other types of fish. If you have any futher questions about goldfish, bettas or other carnival fish, post them and I’ll be sure to answer. I hope that this has helped all you new fish owners out there, or even peaked the interest of anyone that is considering a fish.